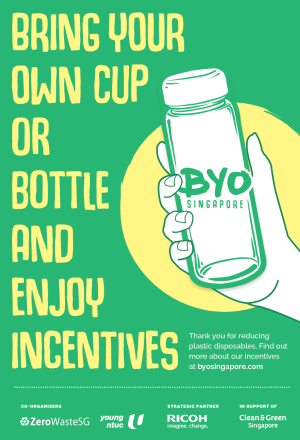 Zero Waste SG has launched the BYO Singapore Guide 2018 to encourage food and beverage (F&B) retailers to take more action in reducing plastic disposables. 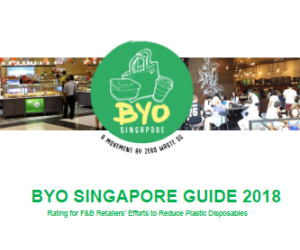 This guide provides a rating of 100 popular F&B retailers in Singapore based on their efforts to reduce single-use plastic disposables, encourage a Bring Your Own (BYO) culture among customers, and list recommendations for them to do more. Single-use plastic disposables pose a serious environmental problem around the world because plastics are made from non-renewable fossil fuel resources, do not break down easily in nature, could release toxic chemicals under certain conditions, and contribute to marine litter that affects wildlife, human health and the environment. Plastic waste is the most common type of waste disposed of at the incineration plants in Singapore, and the burning of plastics produces greenhouse gases which contribute to climate change. Several countries and cities have taken steps to reduce or phase out plastic disposables. In Singapore, there are currently no regulations prohibiting or reducing the use of plastic disposables, especially in the F&B industry, where retailers use a significant amount of single-use plastic disposables. 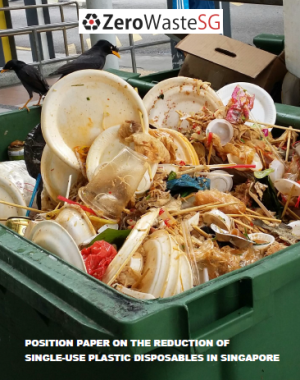 Zero Waste SG believes that it is time for F&B retailers in Singapore to be more serious and take bold actions to reduce our consumption of single-use plastic disposables. Therefore, Zero Waste SG has conducted a public audit of 100 popular retailers to assess the extent of their efforts to reduce the use of single-use disposables and published the rating results in the BYO Singapore Guide 2018. 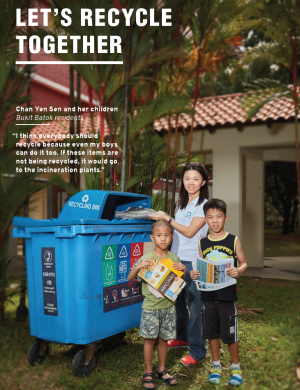 Through the guide, Zero Waste SG hopes to urge the F&B retailers to assess whether they are ahead or behind their peers, and to take the appropriate and right actions to reduce the consumption of plastic disposables. The retailers are selected from different categories such as coffee and tea cafes, bakeries, restaurants, tea and juice kiosks, food kiosks, and fast food restaurants. The audits were completed over 2 months from mid-Jul to mid-Sep 2018 by 53 auditors, who are mostly volunteers and also staff of Zero Waste SG. For each retailer, 3 audits at different outlets were randomly conducted in order for the data collected to be more representative, and the average audit result was chosen from the 3 audit results. All the audits were “mystery shopper” audits, where the identity of the auditor was not revealed to the retail staff, so as to ensure that the audit of the experience at the retail outlet is real. Out of the 100 retailers, only 3 retailers were able to achieve the highest rating of 3 stars. They are Plain Vanilla Bakery, Common Man Coffee Roasters. and SaladStop!. These 3-star retailers should be commended for their holistic efforts in implementing schemes to influence consumer behaviour, altering their operations to reduce single-use disposables, and educating their staff to encourage and welcome a BYO culture. 14 retailers were able to achieve the second highest rating of 2 stars. Most of them had an incentive or disincentive scheme, and also had some initiatives to nudge the customers in reducing plastic disposables or replaced plastic disposables with other sustainable alternatives. The majority of the retailers audited (83 retailers) achieved the low rating of 1 star. This meant that most F&B retailers are not taking enough action to reduce single-use plastic disposables and there is an opportunity for them to catch up with their peers who have achieved 3 or 2-star rating. An encouraging result from the audits was that 94 out of 100 retailers accepted BYO requests from customers. This shows that the majority of F&B retailers are open to the idea of consumers using their own reusable cup, container and bag during purchase. F&B retailers who hope to achieve a higher rating can follow these recommendations that were distilled from the efforts of 3-star retailers: i) identify opportunities to track, reduce and replace plastic disposables; ii) start a plastic reduction and BYO scheme to educate consumers and train staff; and iii) provide incentives or disincentives to encourage customers to BYO. 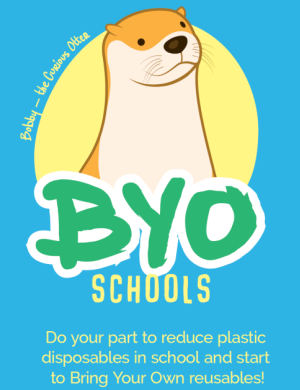 Zero Waste SG looks forward to working closely with the retailers to reduce plastic disposables in Singapore, and achieve a truly Zero Waste Nation. Zero Waste SG and Young NTUC are co-organising the first public forum to discuss about plastic disposables in Singapore. 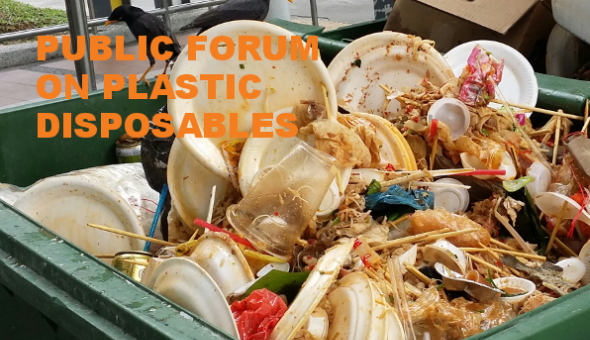 Join us to learn more about the problem of plastic disposables, the current initiatives from groups and organisations, and our plans for a new campaign to encourage reusables! As plastic bag charges have proved to be a success in countries such as the United Kingdom and Hong Kong, local environmental group Zero Waste SG is calling for the Government to impose a levy on the use of plastic bags, with major supermarket chains and retailers taking the lead. The non-governmental organisation made the call in their recommendation paper which was released on Monday (Sep 12). Singapore uses about 2.5 billion plastic bags a year and efforts by the Government to reduce plastic bags consumption have so far been limited, said Mr Eugene Tay, executive director of Zero Waste SG. 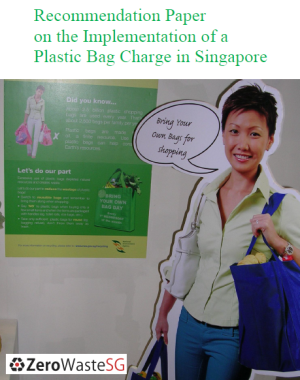 In June 2016, we published our Position Paper on the Reduction of Single-Use Plastic Disposables in Singapore, to urge the government and businesses to develop concrete plans and take bold actions to reduce the consumption of single-use plastic disposables. As a follow-up to our Position Paper and to focus specifically on the problem of excessive usage and wastage of single-use plastic bags in Singapore, Zero Waste SG recently conducted a public survey on a plastic bag charge. The survey would help us to understand the opinion of supermarket shoppers on a charge for plastic bags and whether they are ready for a plastic bag charge in the future. This recommendation paper shows the results of the survey and recommends that the government introduce a mandatory plastic bag charge scheme to reduce the excessive usage and wastage of single-use plastic bags and to encourage people to bring their own reusable bags. A study to assess disposable packaging for takeaway food or dining in, and single-use carriers, was called by the National Environment Agency on Wednesday (Aug 24). To better inform its policies on the use of disposable packaging, NEA will be conducting a study to analyse how different packaging materials commonly used for food compare in terms of cost and impact on the environment, it said in its press release.